At Kay’s Fine Jewelry, our business was born, built and continues to thrive because of one simple but unwavering philosophy. Customers are extended family. Perhaps, we approach things so personally because of our own family’s unique journey. It is one that took us from India all the way to the heart of the Caribbean, and ultimately, into the hearts of customers we have met from around the world. 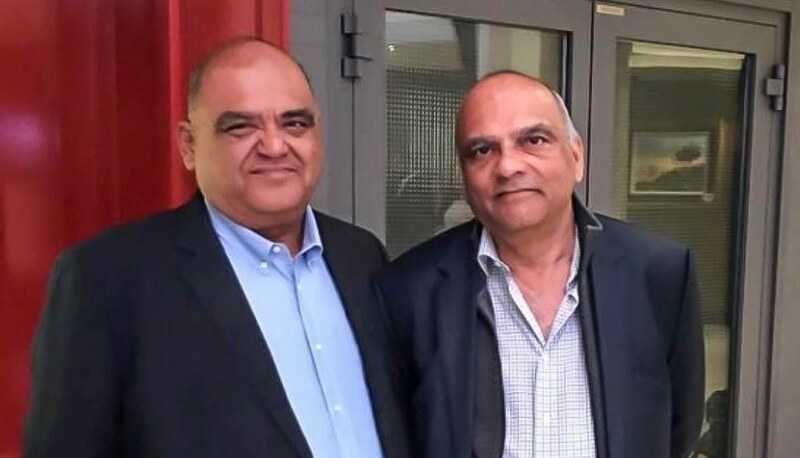 Our company was founded in St. Maarten on the dreams of Dan and Raj Chugani, and from day one Kay's Fine Jewelry was destined to be different. The brothers were relentless in their pursuit to create a jeweler unlike any other in the Caribbean islands, or anywhere else in the world for that matter. They put in endless hours perfecting their expertise of fine jewelry, its design, and its manufacturing. They became experts in every facet of diamond and gemstone sourcing, developing keen eyes for what stones possessed the greatest value, and emerging as two of the world’s foremost authorities on colored diamonds, a passion that still distinguishes Kay’s Fine Jewelry to this day. Just as importantly, it was in our earliest days that the brothers began shaping the family-oriented service philosophy that remains the core of Kay’s Fine Jewelry. We pledge to provide every customer with a level personal care and service no other jeweler can match – and not just during the sale. We also promise to stand by you long after the sale is completed. Whether it’s helping you find matching diamond designs down the road, or helping you prepare to pop the question or celebrate one of life’s many milestones. Our family is here for your family. That is our promise and it’s one we live up to year after year. Kay's Fine Jewelry was built on our family helping yours. We understand that you come to us seeking more than a diamond ring, a fine watch, or a one-of-a-kind piece of custom design jewelry. You come to celebrate moments, commemorate milestones, remember loved ones, and build your own family legacy to pass down for generations to come. Thank you for visiting our website. We invite you to shop our family curated selection of diamond jewelry, fine watches, precious gemstones, engagement rings, wedding and anniversary rings, and investment jewels. We also welcome to you take advantage of our custom design jewelry specialists – artisans eager to handcraft a piece to your exacting specifications. We hope you enjoy shopping with us online. However, we’d sure like to meet you in person. The next time you’re in the Caribbean, we hope you will visit one of our stores in Aruba, Nassau, St. Kitts. St Maarten and St. Thomas. We look forward to meeting your jewelry needs for years to come. You will be extremely happy when you purchase your jewelry at Kay's Fine Jewelry in Aruba. You can be assured that you are buying exquisite pieces at excellent prices, the finest quality, without pressure and the highest integrity. Kay's has also custom designed unique pieces of us over the years. All of our jewelry has been purchased at this location with total confidence over 25 years. Thank you Sunny and Tesh for always regarding us as Kay's family and providing excellent, personal and rewarding service. Kay’s treats you like family! We have been traveling to Aruba for over 20 years but only recently found Kay’s Fine Jewelry Store. Over the past two years, Sunny has been fantastic and treats us like old friends! This March, we were looking to purchase a pair of diamond stud earrings and he worked with us prior to our arrival on what size and price range we were comfortable with. During our visit to their beautiful new store, he spent time to ensure we were happy with our purchase. And we definitely were! In fact, before we left the island, we upgraded my tennis bracelet (purchased last year) and got a new wedding band for my husband, which had to be custom made and was sent overnight to our home. We couldn’t be happier with our gorgeous pieces and with the service Sunny provides! Over the years we have made several trips to Aruba, and early on in our shopping we discovered Kay's Fine Jewelry....and we discovered Sunny. His knowledge of his products, and a willingness to create something special for that special someone, endeared him to me and our family. And when he says he will do something, and gives you a time for completion, it gets done. We have even had him ship us one of our purchases when we couldn't get it while we were on the island. His store is a first class, reputable enterprise. I wanted a band that matched my wedding band. I had been looking about 6 months for it and had gotten about 6 quotes for the ring. When I went to Kay's, they found a ring that matched, except it had a white gold band and my band was yellow gold. They changed the band, resized all 3 rings (original wedding band, engagement ring, and new band), then sauntered them together. It is beautiful and exactly what I wanted--all at a price that was at least $700 less than the lowest price I had previously been quoted anywhere. I love my ring and wear it proudly.